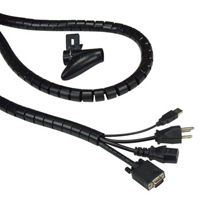 The Aidata Cable Tube accessory is a simple and cost-effective means of hiding any unsightly tangle of exposed computer cables. The kit includes over six feet of durable reusable polypropylene cable tubing. The included cord adapter enables users to quickly gather cords together and within a couple of minutes have them neatly contained in the flexible cable tube. The cable tube housing can also be easily removed if there is a need to access cabling and then just as easily be reinstalled. Both installation and removal can be done while cords are connected. With care users can also arrange to have some cords exit at different locations along the tube, further reducing the exposure of cables connected to various peripheral devices. The Cable Tube from Aidata is a perfect accessory for controlling cabling with height adjustable desks or desktop sit-stand solutions. The cable tubing can also be easily cut to length as needed or combined with additional kits where greater length is required. The Machine Cart (Monitor Riser) with Storage Shelves is a multipurpose modular and reconfigurable office accessory that easily integrates into any office space. This product is designed as a 3-shelf rolling cart that can easily serve as a printer stand while offering 2 additional storage shelves and a drawer. However, the modular design lets it be quickly converted to both a 2-shelf cart and a convenient Monitor Riser or Laptop Stand for desktop use. In addition the segmented modular legs can be configured to change shelf heights, clearance between shelves, or for height adjustment when one of the shelves is used as a monitor riser or laptop stand. 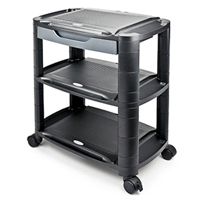 The Machine Cart with Storage Shelves is designed to support up to 75 lbs. of combined weight. The rear of each shelf incorporates a simple cable management guide to aid in keeping a neat workspace. The shelves also features a front slot able to hold a tablet or phone in angled vertical position if being used as a monitor stand or desktop storage and has trays at both sides to hold a smart phone or other smaller office accessories. One shelf also has a storage drawer with removable dividers to provide additional enclosed storage. Each shelf has overall dimensions of 21.6" by 13.8" which includes a 14" W x 13" D flat surface which then tapers slightly down to provide access to the shallow storage areas on each side. Note:If deploying one of the shelves to the desk as a monitor riser or laptop stand be sure to install the included rubberized base segments. These provide stability on the desk and should always be installed. Caps for the top corners provide a clean finish whether assembled as just a cart or if split into two sections - there are 8 caps included. The cap must be removed from the top of each column before the units can be stacked. 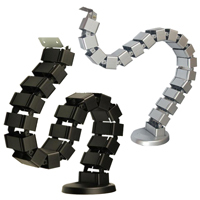 Increase desk space and reduce wire clutter with a ConSet CPU Holder. 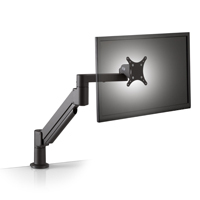 Designed to be mounted to the underside of the desk, the ConSet CPU Holder secures the CPU for free movement with the desk height adjustment, eliminating the risk of monitor and peripheral cables being too short and getting pulled. 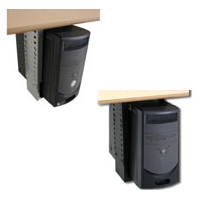 The CPU Holder ensures that your CPU is readily accessible whether you are sitting or standing, helps keep the floor clear, and optimizes the available worksurface. 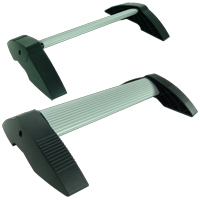 The ConSet CPU Holder is available in both Silver and Black Models to match your ConSet Frame. 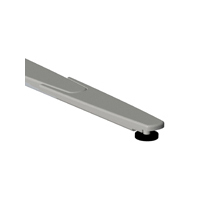 The 501-27 Support Extender Accessory is designed to provide extra stability when mounting larger extra-deep tops on the 501-27 frame, specifically L-shaped tops where the L side is 48". The kit includes both a leg extender which provides enhanced stability for the desk frame as well as an upper frame support which ensures proper support for the return extension of the desk top. The CETUS CPU Holder from ErgoVerse is an ideal accessory for use with the ANDROMEDA Electric Workstation Base, clearing valuable desk space and creating a clutter-free environment. Suspending the CPU ensures that it moves with the desk as height is adjusted, eliminating the need for cable extensions or the risk of items being pulled off of the desk because cables are too short to reach from the floor. 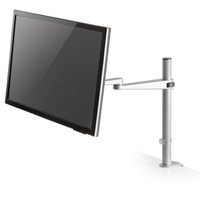 Of course, the CETUS can also be just as useful with any other height adjustable or fixed height desk. 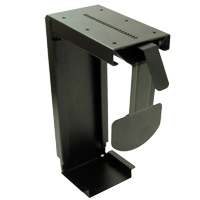 The CETUS CPU Holder features sturdy steel construction and ease of adjustment to support CPUs weighing up to 50 lbs. It is able to accommodate CPUs ranging from 3.1" to 8.6" in width, and from 12.8" to 21.8" in height. 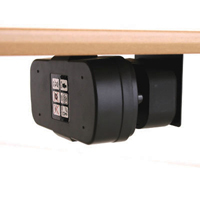 A spring-loaded latch keeps the CPU fully secured in the holder but permits quick access if needed. Le CETUS CPU Holder de ErgoVerse est un accessoire idéal pour l`ANDROMEDA Electric Workstation Base, en offrant une espace sans encombrement, ce qui donne plus d`espace précieux sur le bureau. Le CPU suspendu assure qu`il bouge avec le bureau quand la hauteur est ajuster, ce qui elimine le besoin d`avoir des extentions de câbles ou d`avoir le risque que des objets tombent du bureau parce que les câbles sont trop court pour atteidre du sol. Certainement, le CETUS peut être aussi utiliser avec tout autre bureaux ajustable aussi que les bureaux à hauteur fixe. Le structure robuste du CETUS CPU Holder est en acier et il est facile à ajuster pour supporter les CPUs qui pessent jusqu`à 50 livres. Il est compatible avec les CPUs entre 3.1 po à 8.6po de largeur, et de 12.8po à 21.8po d`hauteur. Un verrou chargé en élasticité (spring-loaded latch) garde le CPU en tout sécuriter dans le support mais permet aussi l`accès vite fait, si nécessaire.